MEET THE SKRULLS #2 adds more depth to the story, establishing this as a must-read new series from Marvel. The artwork and storytelling are on-point, perfectly complementing one another. The Warner family advances their plans for conquest of Earth in Meet the Skrulls #2. 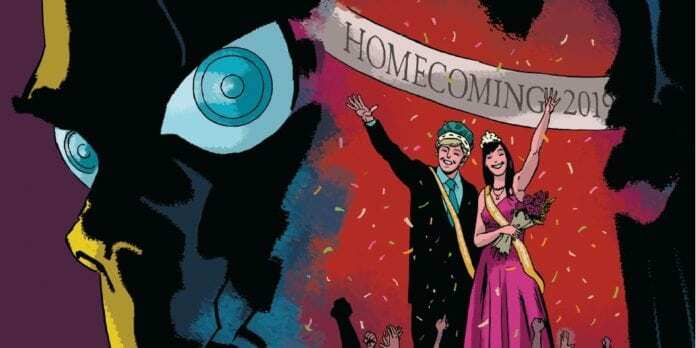 This latest issue takes everything that worked in the series debut and ups the ante, zeroing in on some of the darker themes and ratcheting up the tension. In the first issue, we got nods to the deeper tension within the story. This issue does the same, expanding on those plot threads without losing any momentum. The story itself is interesting, as we follow each member of the family’s approach to their role in their mission in Meet the Skrulls #2. But what makes it truly great is how the story is told. While the plot seems to center around the younger daughter, Alice, each member of the family generates pathos. More than that, we get a sense of the emotional toll it exacts. Robbie Thompson’s writing excels in many areas in Meet the Skrulls #2. However, one thing that is striking here is the tight storytelling. Not a single word is wasted; each line of dialogue is deliberate and precisely-tuned to expand the story. In some cases, even the absence of dialogue can convey a lot of meaning, with a well-placed silence saying more than an entire conversation. This is a narrative with zero fat or filler material. Niko Henrichon’s artwork is, again, brilliant here. As mentioned above, a well-placed silence can speak volumes. To work, though, it requires an artist capable of conveying the emotional weight. Fortunately, Henrichon is up to the task. From the opening page of Meet the Skrulls #2, on which we see the destruction of the Skrull Throneworld at Galactus’ hands, he does an amazing job juxtaposing intensity and uneasy calm. This quality carries through, all the way to the last page of the book. The character designs also shine in this issue. They’re pleasing on their own, but they also afford an incredible range of expressiveness. As a result, you can feel the emotional weight of those pauses in the dialogue. Without the quality on display here, a lot of the book’s strongest attributes from a storytelling perspective would go underutilized. Meet the Skrulls #2 establishes the series as one of the best books in Marvel’s current roster of titles. If you’re not already following it, now’s the time to get on board.